Combining gender-neutral aesthetics with top-notch customer service, Nail Bar Milwaukee ups the ante for the nail salon scene in Milwaukee. 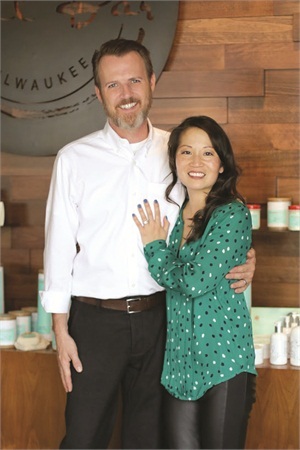 Tyan Soo, who has a background in hospitality, opened Nail Bar Milwaukee because she felt there was a glaring need for salons in Milwaukee that gave better customer service, consistency, and had more attention to detail, sanitation, and disinfection. 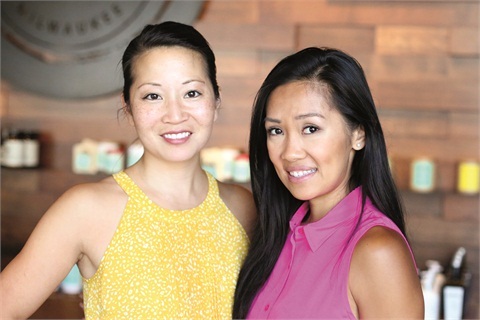 She brought in Van Nguyen, a salon consultant, to help train nail techs and implement ideas. Soo and Nguyen are also licensed nail technicians, and Nguyen has experience as a tech with three previous salons, so they felt they could fill in the gaps left by other salons by opening their own. The salon is located in an affluent area of Milwaukee close to the lake known as the Upper East Side. Soo describes the street where Nail Bar Milwaukee is located as a fixture in the city that has undergone some rejuvenation recently and has some great foot traffic that has helped the salon. Nail Bar Milwaukee is located in what was formerly an empty gravel space under a parking garage that was never rented. Soo, with the help of her husband and team, was able to do a full build-out of the space to make it exactly to her specifications. Nail Bar Milwaukee offers a variety of services for customers. The manicure and pedicure services include classic, spa, no-chip, and rejuvenation — for brittle or dry nails between services. 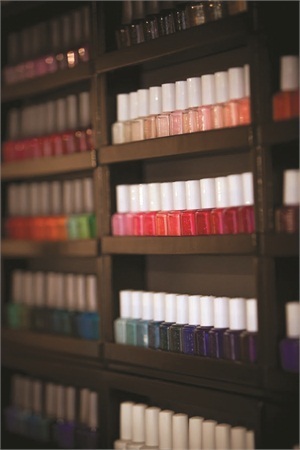 Plus, the salon offers nail enhancements such as gel powder and LCN. And with more than 10 different brands of polish and gel-polish, clients are never left wanting for colors. The salon also offers full-body waxing and facial threading, and Pampered Prince or Princess services for clients under 12 with additions such as all-natural nail tattoos. Customers are encouraged to join the salon’s loyalty program as a way to build points for dollars off an upcoming service. Soo wanted to go with a gender neutral decor in order to entice both male and female clients. She also wanted a room with good flow that is aesthetically pleasing. Rather than use pedicure stations, Soo opted for one long pedicure bench that allows for conversation and camaraderie. And with nine manicure stations and a nail bar, the salon is equipped to service 23 customers at a time. The salon also has a waxing and threading room that is complete with an antique steel door from Chicago. Soo decided on concrete floors, wood paneling, steel products, hemp lights, and charcoal and grey colors. She installed a cloud-like mural on the wall for a softer finish, giving the salon an overall tranquil look. 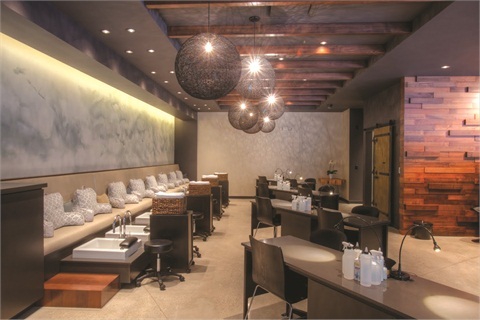 With its gender neutral decor, Nail Bar Milwaukee is able to bring in male clients as 5%-10% of their customer base, and Soo says she’s seeing that number grow. Due to its location, the salon also sees an affluent clientele that likes to stay current with nail trends — whether that be nail art or the latest polish color. Nguyen is there to help aid new nail techs with their training. She sits with them while they work with clients, helping them figure out the best technique. “I understand that some of these girls never had any individual attention from other salon owners even if they’ve been in the industry for five or six years,” she says. Plus, she explains, other nail salons don’t necessarily want to give their techs the proper education in case those techs decide to use those skills elsewhere. Acknowledging there is no way around that, she thinks it’s important for techs to do good work and be confident while at Nail Bar Milwaukee. Nguyen and Soo are also aware of many techs in the industry working long hours, which is why they’ve worked hard to staff the salon thoroughly. Free nail services and facial waxing are available to nail techs, as well as a 10% discount to their family members. Plus, the techs get 20% off retail items and a 50% discount off body waxing. The salon focuses on offering no-chip manicures, having multiple brands to choose from, offering online bookings, and listening to clients to make sure they are happy. The salon uses organic spa products that are made in the U.S. “We want to be aware of all of our products because they go into the sewer system. We want to make sure it all dissolves,” Nguyen explains. The salon also retails the items it uses in its services, such as Spa by Infusion Organique and Qtica Smart Spa as well as all its polishes. Additionally, Nail Bar Milwaukee tries to make sure the retail price points are reasonable in regards to the city. “We’re not in Chicago so we’re not going to sell a diffuser for $40. Everything is under $25,” Soo says. The other reason why Nail Bar Milwaukee has seen such immediate success is because of its dedication to customer service, especially when compared to other salons in the area.